Hello Friends, I am so super excited!! Jeannie is here from Kindergarten Lifestyleto while I am away with my daughter. 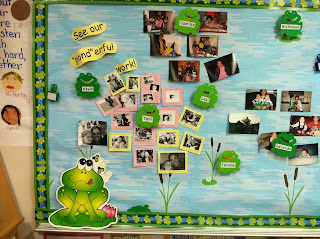 She is a wonderful Kindergarten teacher and her blog is Fabu-Lo-Sooooo!! I will be back soon. Until then enjoy my favorite Kindergarten Bloggy Friends and show then lots of teacher love!! As summer winds down, teachers begin piling back into classrooms across the world. There's so much to do....so many bulletin boards to prep.....There's one board in my classroom that I believe is the MOST important board. It's called the "Family and Friends Board". When people walk in my room I often hear, "Wow!" or "Looookkk, they are so cute!" or "Oh my gosh, I gotta do this!". I'm not a big decorator so it's not for my cute pom poms hanging or my matching decor around the room.....The "wows" are over my "Family and Friends Board". 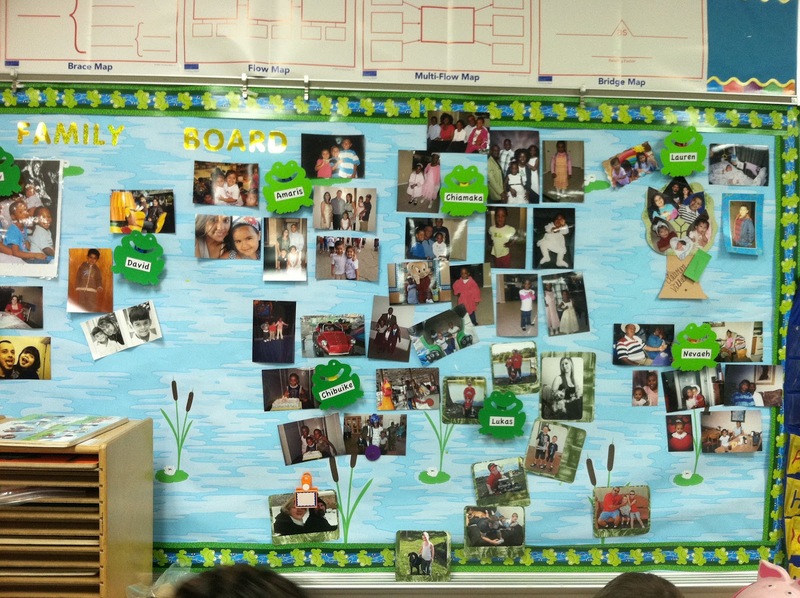 Each year I dedicate an entire bulletin board (a large one) to our "Family and Friends Board". So, why do I dedicate such a large space to this board????? 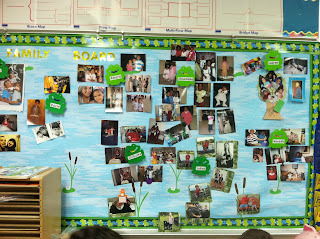 People say to me what a great thing this board is for the kids.... And, I agree. my kids love it! It really helps them "own" our classroom. They feel like they are apart of our "kindergarten world" - like staking claim to our classroom and all the things that go on inside our 4 walls. 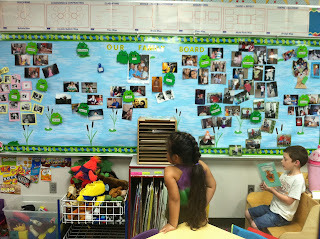 My kids often visit the board when they are in the block center or abc center (which happen to be beside the board). They also will visit during writer's workshop at times. 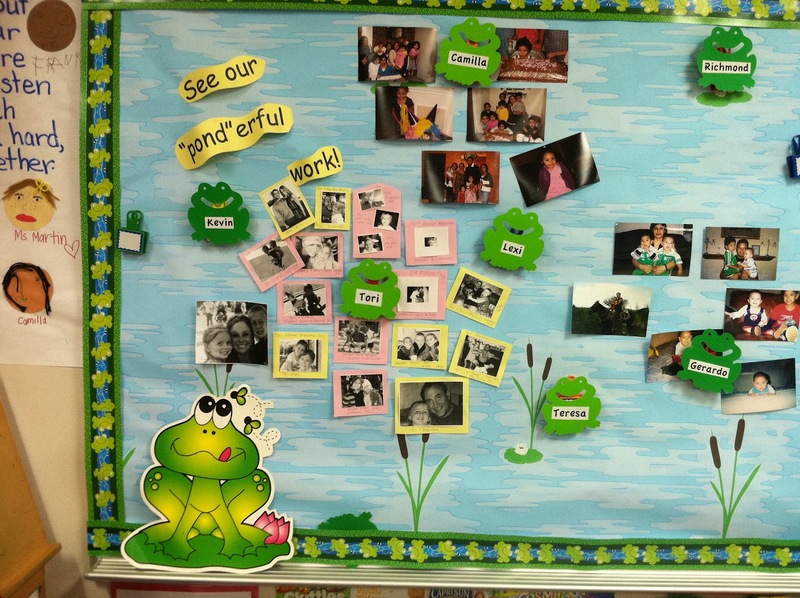 Oh, the oral language that takes place concerning the photos on that board is incredible. Kids talk about some of their photos....when the photo was taken, what they were doing, who is in the photo with them, etc. But they are even more interested in other kids' photos. I have a few children with connections to Africa. One of my students has a photo with his mom dressed up in traditional African garments. Boy, that is the talk of the room! I have lots of children from Mexico with a variety of traditions that can be seen through the photos. What great diversity learning for these kiddos! .......but, as important as I think this board is to my students and their growth socially, emotionally, and yes academically - I know this board is important to me too. As a teacher who has taught many children now..... it's easy to get lost in the day-to-day tasks and stresses. It's easy to get lost in pushing kids to excel according to state standards. It's easy to get lost when you have a "sweet-tart". 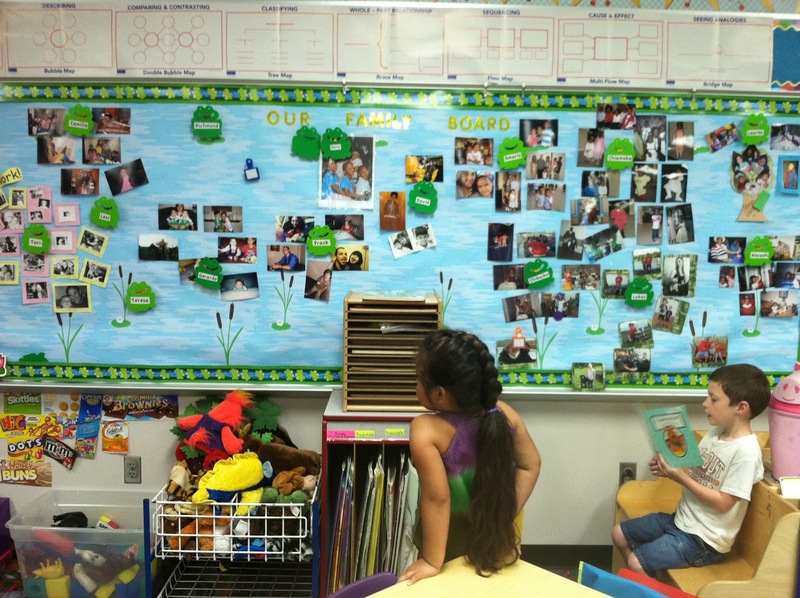 But, this board allows me a chance to reflect on the children they are....the people they are.... the families they belong to..... The hopes and dreams that they and their family have for the future...... And, it makes me realize how truly lucky I am to be apart of their lives. I am honored each day to impact my students' lives and I pray that I do it in such a way that will help them move one step further to their hopes and dreams! You can grab this FREEBIE note for your own "Family and Friends" board HERE!! Tell me what you think! Have you ever had a board like this? What are your thoughts and feeling? I'm interested to hear! I love you to come over to Kindergarten Lifestyle for a visit. I will be posting lots of classroom set-up ideas pretty soon!